Grilled tofu is one of the excellent choice of low calorie recipes. Its low fat and healthy. We use vegetables and we grill the dish in the oven, which mean it’s containing low oil percentage. 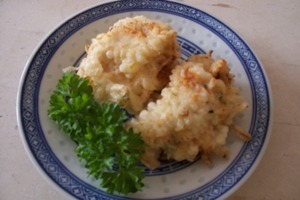 This oriental recipe is easy to make and you don’t need much time to prepare it. If you will go somewhere to spend a day out with the children, you can take this grilled tofu along with you with some rice, and this dish would be a warm welcome as a lunch. They are easy to package because they are dry dish especially if you use special flour that you can obtain at the Chinese supermarket like Tempura Batter Mix . This kind of flour make the grill tofu very crispy and delicious. Of if you have a party or your friends come along to your house. This kind of dish is very suitable for such occasion. It's easy to make in big quantity. Shall we try this delicious tofu recipe? 250 gram chicken, wash with lemon juice or vinegar, then washed with clean water make it dry with kitchen towels and chopped until you get very small pieces. Make a smooth paste of shallots, garlic, black pepper and salt. Set aside. Heat a little bit oil in the pan, and fry the smooth paste until fragrant. Add the pieces of chicken, stir it until done. Add carrots and the smashed tofu. Stir it until the mix well. Taste it and add some more salt to your taste. Remove from the fire. Make the heat proof dish ready that has been oiled. Pour the mixture into the dish. Scatter above the mixture: bean sprouts, spring onions, parsley and the beaten eggs. When the dish has cooled, cut into squares. 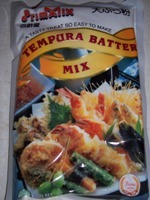 Dust with mix flour or tempura mix and dip into the beaten eggs or tempura mix with water. Grilled them in the oven until they are golden brown.